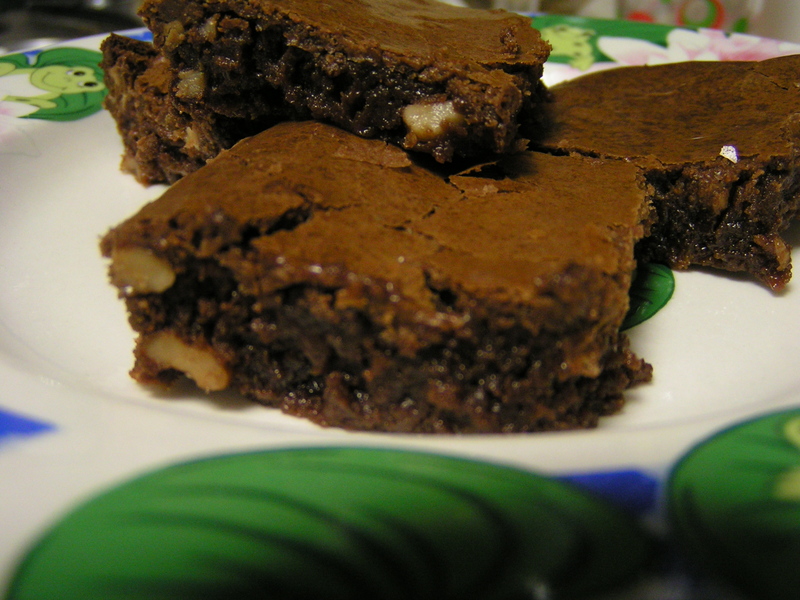 A week or so back, I was making Cream Cheese Brownies for Mom. Hubby plaintively asked, “Why don’t you ever make us brownies?? ?” He likes the plain, fudgy kind. And since he has been on vacation, I thought I could accommodate his request. After all, he DID just give me a new bed! And I’ve been dieing to use the bar pan that Aggie gave me. So this was a perfect opportunity. 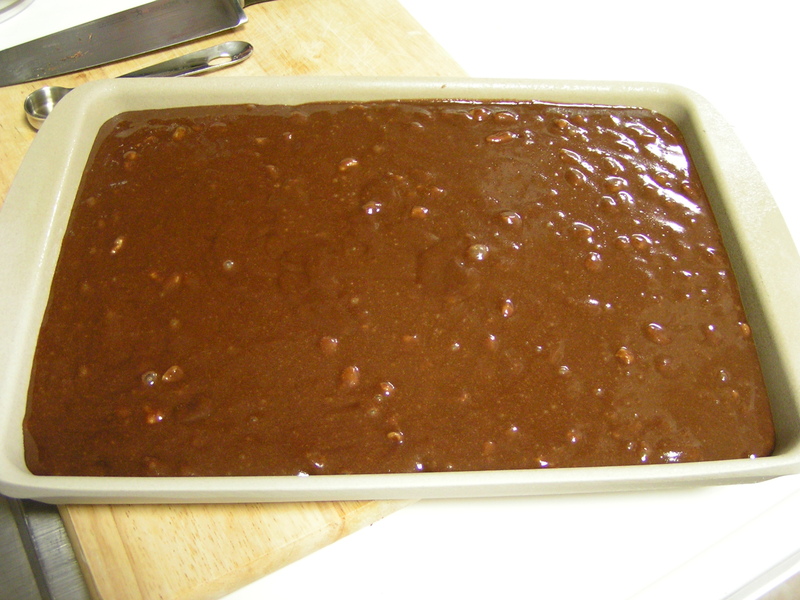 In a microwaveable bowl, combine 1/2 cup butter, cut up, and 4 oz unsweetened chocolate, chopped. Microwave for 1 minute, stir well. If lumps remain, microwave again, in 30 second increments, stirring in between until all of the chocolate and butter are melted. Stir WELL. Your arm will be very tired. The mixture should look slightly glossy. Slowly add (still stirring) 1 1/4 cup granulated sugar. Stir until well mixed. Then add 1 tsp vanilla extract. Keep stirring. The mixture will look a bit granulated from the sugar, but just keep stirring. Add 2 large eggs, 1 at a time, stirring well to incorporate each egg. The mixture should begin to look smooth. Add 1/2 cup flour and 1/4 tsp salt. Stir until incorporated. Add 1/2 to 1 cup of any nuts that blow your skirt up (or shorts). I used walnuts, half a cup, but could easily have used more. Bake 25-30 minutes if using the 9×9 inch pan, about 1 hour in the 9×13. Cool on the stove top, then chill in the fridge at least an hour before cutting. 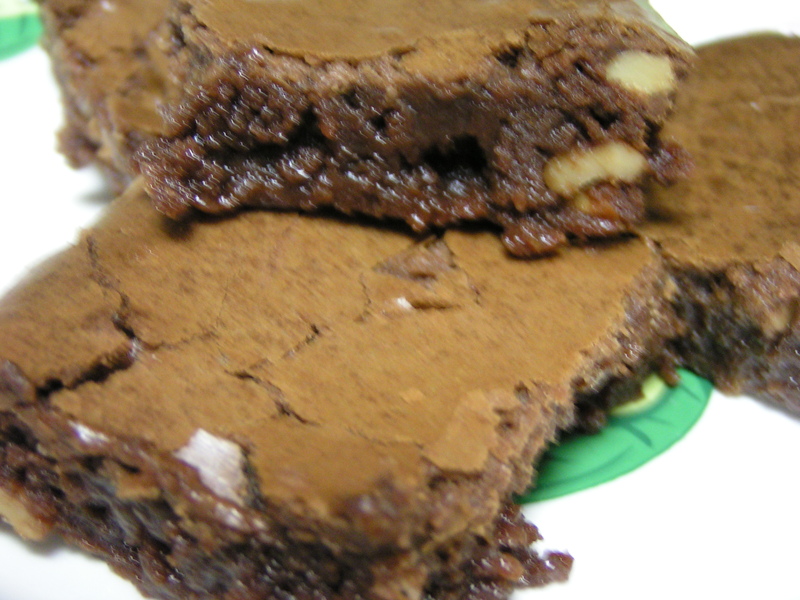 These are VERY fudgy, almost molten brownies. Delish! I love those bar pans! and the brownies sound delicioso! I gained two pounds reading this. Also, add marshmallows next time! Marshmallows sound good. Think I’m going to try a different brownie recipe next week. This one was supposed to have a cream cheese layer, but I just left it off. They are really fudgy and sticky! But of course, really chocolaty and delicious!